With this morning's continuing fallout from the latest JPM debacle, we should see the completion of the smaller H&S pattern we've been watching. 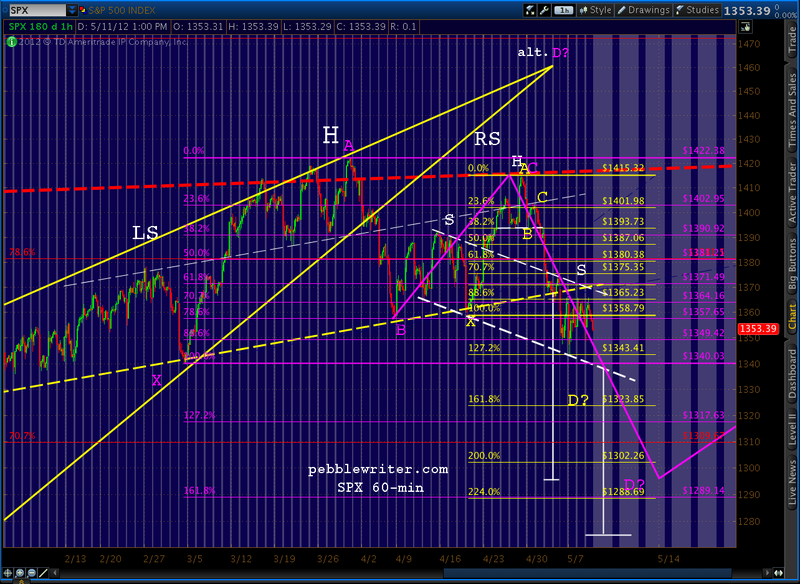 The neckline is around 1338, so look for a bounce around there on the opening. The subsequent completion of the right shoulder at the Bat pattern .886 target of 1415 [see: A Swing and a Hit] got the downside started on May 1, and it's been all gravy since then -- complete with the completion and back test of the larger H&S and now, completion of the smaller H&S pattern. 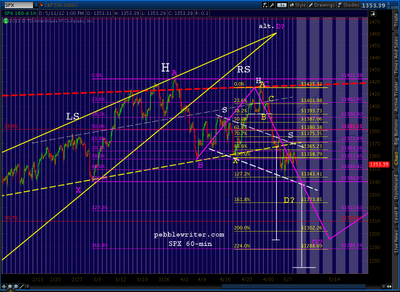 I was looking at my flash-crash 2010 60min chart...looking for similarities with the current pattern. Is this Monday, like Monday May 3'rd? Hmm. May'4 2010 had a big gap lower..then mostly trundle sideways for 2 days, but slowly slipping lower.